Associated Press: The share of respondents who said it’s a good time to sell also climbed in April, according to Fannie Mae. 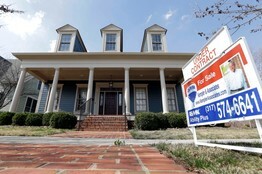 More than half of Americans now expect the country’s home prices to climb within the next year, illustrating a growing optimism toward the health of the housing industry, according to new data from mortgage-finance company Fannie Mae. The share of respondents polled in Fannie’s April housing survey who expect home prices to go up rose three percentage points in April to 51%. At the same time last year, only 32% expected an increase in home prices. The share of respondents who say now is a good time to sell climbed four percentage points in April to 30% compared with 15% at the same time last year. According to the survey’s results, the average 12-month home-price-change expectation held steady at 2.7%. The share of respondents who say mortgage rates will go up fell three percentage points to 43%, while those who say they will go down increased slightly to 7%. The share of respondents who say the economy is on the right track increased four percentage points over March to 39%. Fannie’s national housing survey polled 1,001 Americans via live telephone interview to assess their attitudes toward owning and renting a home, home and rental price changes, homeownership distress, the economy, household finances, and overall consumer confidence. Homeowners and renters are asked more than 100 questions.